Stocks rose to new record highs last Friday, capping the benchmark S&P 500’s fourth weekly advance, the longest stretch of gains since July. Investor sentiment got a boost following a pledge from President Trump that his tax reform plan will be released in a matter of weeks. Meanwhile, in Congressional testimony, Federal Reserve Chair Janet Yellen said that “waiting too long to remove (rate) accommodation would be unwise,” adding that further rate hikes are likely needed if economic recovery remains on track. Financials led the advance during the week, while all but nine of the 60 companies in the healthcare sector posted gains. The Stoxx Europe 600 Index registered a third straight weekly gain, rising 0.9%; while the MSCI Emerging Markets Index advanced just shy of 1% last week. The S&P 500 rose +1.6% last week, the Dow Industrials advanced +1.75%, and the MSCI EAFE (developed international) gained +0.86%. With around 78% of S&P 500 companies reporting fourth quarter results to date, 75% have beaten analysts’ consensus EPS expectations and 51% have topped their sales expectations. Forward earnings guidance trends, however, remain weak for large caps and better for small caps. Overall, large cap consensus earnings growth expectations for the fourth quarter have moved higher, but first quarter 2017 and full-year guidance have edged lower. For mid and small cap stocks, 74% and 64% have respectively beaten consensus profit forecasts, while 56% of midcaps and 57% of small caps have exceeded their sales expectations. According to Credit Suisse, shown in the Figure 1, forward earnings guidance trends have weakened for large caps over the past few weeks (orange line) and continue to look weak relative to history. Of those that have changed previously announced guidance, just 53% of large caps have raised guidance (vs. 58% as the prior week). This is down from the third quarter 2016 when 61% had raised guidance, and below its long term average of 65%. Comparatively, fourth quarter trends have brightened for small caps (the blue line). 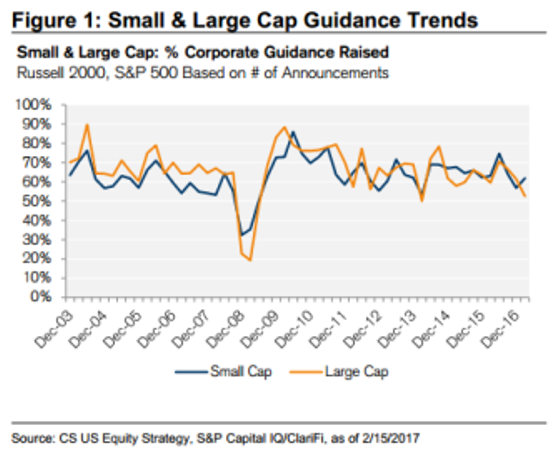 Of those that have changed previously announced guidance, 62% of small caps have raised guidance. This is up slightly from last quarter, when 57% had raised guidance and in-line with its long term average.